College is an expensive endeavor, but the largest investment for most people is buying a home. And let’s face it, it’s typically the next step after graduating from college and landing a job. Since the gravity of buying real estate is profound, we took the liberty of shedding light on the five myths listed below. This information will empower you financially as you progress in life. This is the most common myth we hear on a regular basis. Unfortunately, this misinformation deters many would-be home buyers. In fact, not only do you NOT need two years on the job, one month is often sufficient. While some financial institutions do have this requirement, simply put, we do not. If we can document a two-year timeline of work and school, then we can qualify you with your new base income. Any money received as commission (non-guaranteed), bonus and/or overtime may not be counted until it has been received and documented for a two-year history. Your base income, on the other hand, can be counted after one month on the job. Often, it is all that is needed for qualification purposes, depending on your other monthly bills. 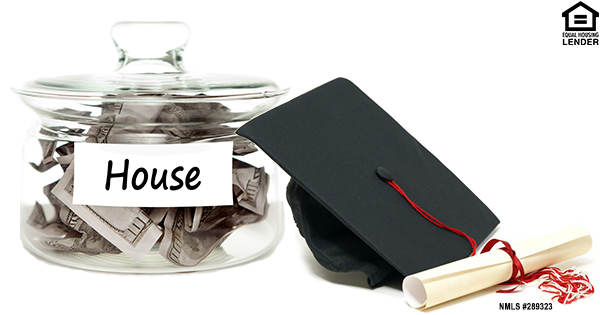 When applying for a mortgage, be sure to have your school transcripts handy to document your history. They do not need to be official transcripts, but they should include information such as your name, school name, dates of enrollment and designation earned. Big Debts? No Home for You! In mortgage lending, the amount of debt you have is not a consideration for getting approved for a loan, but rather the monthly payments associated with your debt. Let’s say you owe $1 million in student loans, and you have an amazingly low payment of $400 per month for this debt (unlikely, yes, but you’ll get the picture). We would only consider the $400 in your debt-to-income analysis. Debt-to-income is the percentage of income that goes toward paying all recurring financed payments, and it is a major factor in determining how much money you can borrow. Depending on the loan program for which you are applying (we will counsel you on the best options to consider), some student-loan payments may be omitted from your debt-to-income analysis if they will be deferred for at least a year from the date your loan funds. Don’t let the media fool you. We honestly think getting approved for a loan is rather easy. In fact, low down payments are available with VA, USDA loans, conventional loans and FHA loans. It is common for these lower down-payment options to have the low interest. Your down payment may also come in the form of a gift from a family member, in many cases. Here’s something that’s not a myth: Most parents would rather provide a gift for a down payment instead of co-signing on a mortgage. While credit-score requirements can vary based on loan programs, a higher score never hurts. Most people look befuddled when they hear how lenient credit requirements are, as opposed to what the media broadcasts. Regardless of your credit score, here’s a tidbit of info that can help you. Many consumers mistakenly think that because they pay their cards down each month, they are positioning themselves for the highest credit score. Wrong! Here’s why: The balances on your cards are reported and scored by the credit bureaus once your statements are published. Why is that important? Take the following example. Jill has a $500 limit on her credit card. Her monthly statement reads she has a balance of $450. She goes online and pays it down to $20. But it’s too late. Remember, the balances on your cards are reported and scored by the credit bureaus once your statements are published. What she should have done is pay it down to $20 before the monthly bill gets published. Now, the $450 balance on the $500 credit line was already reported, giving Jill an undesirable debt-to-available-debt rating. Remember: the trick to the credit game, in this sense, is to pay the balance down prior to the statement cutoff date. In short, we would never encourage you to enter into a mortgage loan that you would not be able to afford, even if you could get approved for one. Only you know your personal spending habits and expenses that may not appear on your credit report. You went to school to better yourself, not to work your tail off to make a high mortgage payment. So use your judgment, and you be the one to govern how much you desire to spend. Please keep in mind the above information is designed for The Florida Mortgage Firm clients. While there are some banks and lenders out there that do not follow these guidelines and options, we ensure we have a multitude of products, with varying guidelines, at ultra-competitive market rates and costs. We are The Florida Mortgage Firm, and lending on Floridian homes is what we do. If you are looking for expert advice, a thorough preapproval, or just an amazing deal on a home mortgage, then call the professionals. ⟵Can I Buy A New Home And Keep My Old One, And Should I?